About – "…she's a flight risk." Starting in March of 2003 I began writing “Memoirs of a Post-Adolescent, International Fugitive,” an online diary of life “on the run” that would eventually become the “…she’s a flight risk.” weblog. The early version quickly attracted attention and became the subject of a rather smarmy Wired article by Leander Kahney (“Blogger: Catch me if you Can”), and a somewhat experimental piece (“The Search for Isabella V.“) written by John Richardson for Esquire magazine. It was early days for weblogs, and the media’s interest in (and abject terror of) the new medium and the writers who favoured it prompted the alarmed spilling of quite a lot of ink, digital and otherwise. In May of 2004 I posted an .mp3 of a 70 minute mix of music I was fond of playing while flying over some of the wilder places in the world. That became “Flight Risk Radio” and eventually a full-time Shoutcast server was featured on the sidebar of the weblog. 12 different original programs, mostly new mixes I made to fly to, eventually made their way to “…she’s a flight risk” readers that way. 2005 and 2006 were very difficult years for me. 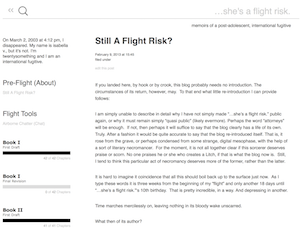 The very conflicts that prompted me to start “…she’s a flight risk.” forced me to stop penning entries. Posting flagged in 2005, then stopped entirely. In a sort of last, desperate gasp, I typed in the last formal entry (titled “VIII”, after the poem written in 1924 by Emily Dickinson, which the post dutifully reproduced). The original blog had by then moved far from its roots on Blogger/Blogspot to http://shes.aflightrisk.org. I copy-pasted that last entry in the wee hours before dawn on Sunday, March 26th, 2006. I have a vague memory of sitting in the sand trying to hold my laptop just right to get enough signal on my PCMCIA wireless card from the unsecured WiFi router of some far-off hotel in Aruba but it was so long ago, even those details seem vague and nebulous now. Was that Aruba visit when I wrote the last entry, or was that some earlier entry? Was it some other place entirely? I cannot rightly recall). Still, after the lone entry in 2006, it was destined to be a long time before I had internet access again. Apparently, however, the blog lingered on for some while, carried on mostly, I think, by momentum (and the systems administration efforts of Jay, “…she’s a flight risk”‘s loyal IT guru from got.net). Still, eventually all things must fade. The Panamanian law firm that managed such matters evaporated when the senior partner retired. I was not in a position to take charge of my own affairs at that time, and I expect that when bills stopped being paid, emails and letters went unanswered, and, the basic requirements of commerce no longer in evidence, the “…she’s a flight risk” weblog staggered, and finally went dark. Time passed. I found myself back in something like civilisation at one point and eventually in safer circumstances than I had once been. I suppose when life slows down, the mind drifts more and more to reflection, and retrospection. I was stunned to realise one evening that the 10 year anniversary of the first post on the old weblog was approaching. Once, I had been diligent about archiving things, and buried in a water-proof cache I had left years before, and which I dug up for other reasons best left unmentioned here, I found two CD-R discs and USB drive. One disc was ruined, but the other and the USB stick contained a trove of old “…she’s a flight risk.” files including webserver logs, years of email, and so forth. I had a long nostalgic cry going through what I could salvage, and then mostly forgot about it all… until a very curious thing happened. Just about the time I began to wonder if it might be fun to post the old blog somewhere, the incomparable Jamie Zawinski, in a labour of love that still brings a tear to my eye now and again, first rediscovered, and then quasi-resurrected the blog on his own site in January 2013. He did so almost entirely by culling old entries from archive.org, a thankless task that still boggles my mind. Contemplation of that effort inspired me to think about bringing it all back. Could I find what I needed among my old archives to bring the old “…she’s a flight risk.” back to life in a way that would do it justice for its first double-digit birthday? As it turned out: yes. In Spring of 2013, I put up the entire set of blog entries from 2003-2006 along with the comments, which I was pleased to see had been preserved (though I spent literally weeks cleaning up the online-casino, erectile dysfunction, and hair-growth spam from that section). “…she’s a flight risk.” had returned, so to speak. You can read the introductory post that graced the front page (“Still a Flight Risk?”, February 9, 2013 ) at the bottom of this entry. Now and again flashes of nostalgia are resurrected from the deterus of ancient weblog bit rot, and a little flurry of interest flares again, on Quora, for instance (“Mysteries: Did anyone ever discover the truth about the blogger ‘she’s a flight risk’?“), or the seventh entry in NYMag’s 2017 article: “The 20 Most Terrifying Stories on the Internet.” Unfinished business from long ago, as it were. The web was much different then. Filled with raw, individual, and (most importantly) unfiltered voices. Less commercial. Nearly apolitical. It seems almost quaint now, and that’s an awful thing to realise. But you had to be there. No, really. You had to be there. Internet speaking, it was a different time, and if you didn’t live though it, it is awfully hard to convey what those heady days were like. That said, I sort of feel like trying anyhow. Perhaps you’re interested regardless of your connection (or lack thereof) to 2003. Perhaps you are a couple glasses of wine into your Saturday night, and a trip down memory lane is unavoidable. Perhaps you are an old reader and the upcoming novels aren’t enough “bonus material” for you. Perhaps you just stumbled across this strange place and can’t tear yourself away. I hope it is one of those things, or something like one of those things, because I like to think that my efforts might entertain you, but I have selfish reasons too. It is a bit of catharsis for me to go through the exercise of remembering the Post-Adolescent International Fugitive that wrote in these pages. So, in this blog you have found your way to my personal remembrances of “…she’s a flight risk.”. The “author’s commentary track” if you will. You will find them typed up as annotations to the original blog entries from from 2003-2006, presented here in original form (typos and all) and original order as I get to each one. Up top, next to this menu item, take a look at the Frequently Asked Questions section, as well as a “Where Are They Now” page, a running catalogue of current research on the links and references that were in the old blog which I will add to as I work my way through the old posts. Who knows what I might find as I cull through the recovered material I dug back up? So… welcome. Or, perhaps, welcome back. Either way, it’s been quite a while, hasn’t it? I am simply unable to describe in detail why I have not simply made “…she’s a flight risk.” public again, or why it must remain simply “quasi public” (likely evermore). Perhaps the word “attorneys” will be enough. If not, then perhaps it will suffice to say that the blog clearly has a life of its own. Truly. After a fashion it would be quite accurate to say that the blog re-introduced itself. That is, it rose from the grave, or perhaps condensed from some strange, digital mesophase, with the help of a sort of literary necromancer. For the moment, it is not all together clear if this sorcerer deserves praise or scorn. No one praises he or she who creates a Litch, if that is what the blog now is. Still, I tend to think this particular act of necromancy deserves more of the former, rather than the latter. It is hard to imagine it coincidence that all this should boil back up to the surface just now. As I type these words it is three weeks from the beginning of my “flight” and only another 18 days until “…she’s a flight risk.”‘s 10th birthday. That is pretty incredible, in a way. And depressing in another. Time marches mercilessly on, leaving nothing in its bloody wake unscarred. What then of its author? Here too there are limits to the tales I can tell. Certainly, I endure. Time scarred me as well. Left deep brands, as a matter of fact. But who doesn’t bear the marks of decisions delayed or made? As I read back through these pages and meet that girl again, or at least her ghost, or perhaps her shade, I barely recognize her. There are times I wish I could shake sense into her. Times I laugh along with her. Times I share her bitterness for the circumstances around her (even where she created them herself). Most of all I am struck by how truly young she was. Young beyond her years. Such are the vices of a sheltered upbringing, perhaps. In some ways the world has passed “…she’s a flight risk.” by. It is hard not to chuckle at its bandwidth warnings accompanying 400 kilobyte .gifs. Difficult to credit the travel tricks that worked back then in the context of today’s security gauntlets. Or that Airsnort once was “a thing.” But the sum of the many entries that make up the blog’s history are more than just a snapshot. They are a film reel spanning years. Today I am perhaps most struck by the evolution that one sees animated in the many frames the make up the reel. Until its recent resurrection, I hadn’t considered revisiting the subject matter that so occupied me those years ago. And perhaps I will yet pen the definitive “memoirs of a post-adolescent, international fugitive.” Or perhaps not. But maybe there is still something for the long-time reader of “…she’s a flight risk.” Certainly, if you found entertaining my musings on nothing much at all, or the scraps of internet interest I served from time to time, or perhaps if Flight Risk Radio had appeal, there is something here for you after all, and after all these years. I am not like to answer questions to the satisfaction of many. Nor am I prone to long online debates. But I do still enjoy internet tidbits, videos, and mixing music, and it takes very little effort to share a picture, peck out a thought, stream a set, or muse with readers in comments in my spare time. I’m thirtysomething and I was an international fugitive, of sorts. My name will always be isabella v. But it isn’t.